Until recently, type 2 diabetes was seen as a disease caused by an impaired ability of insulin to promote the uptake and utilisation of glucose. Work on forkhead box protein O (FOXO) transcription factors revealed new aspects of insulin action that have led us to articulate a liver- and beta cell-centric narrative of diabetes pathophysiology and treatment. FOXO integrate a surprisingly diverse subset of biological functions to promote metabolic flexibility. In the liver, they controls the glucokinase/glucose-6-phosphatase switch and bile acid pool composition, directing carbons to glucose or lipid utilisation, thus providing a unifying mechanism for the two abnormalities of the diabetic liver: excessive glucose production and increased lipid synthesis and secretion. Moreover, FOXO are necessary to maintain beta cell differentiation, and diabetes development is associated with a gradual loss of FOXO function that brings about beta cell dedifferentiation. We proposed that dedifferentiation is the main cause of beta cell failure and conversion into non-beta endocrine cells, and that treatment should restore beta cell differentiation. Our studies investigating these proposals have revealed new dimensions to the pathophysiology of diabetes that can be leveraged to design new therapies. This article is based on the Claude Bernard lecture given by Domenico Accili at the EASD Annual Meeting September 2014. An erratum to this article can be found at http://dx.doi.org/10.1007/s00125-015-3758-6. Type 2 diabetes is caused by insulin resistance and pancreatic beta cell failure . Prevention and outcome studies demonstrate that treatments for insulin resistance outperform and are more durable that insulin secretagogues [2, 3]. Yet, with the exception of thiazolidinediones, treatment options for insulin resistance have remained unchanged since the 1940s, when reports of the unexpected glucose-lowering properties of a new class of anti-malarial agents, the biguanides, first raised awareness of their potential as glucose-lowering drugs . Lack of novel insulin sensitisers is likely to be attributable to a combination of incomplete knowledge of therapeutic profiles, and pleiotropic effects of effective molecular targets. On the beta cell front, although the introduction of incretins has contributed to shifting focus from stimulating insulin secretion to maintaining beta cell health , there remain yawning gaps in the understanding of beta cell dysfunction . We have sought to establish a mechanistic link between genetics, cellular, and molecular biology of forkhead box protein O (FOXO) transcription factors and the pathophysiology of insulin resistance, obesity and diabetes . In return, this systematic effort to map and define the metabolic role of FOXO has suggested a unifying mechanism to explain how insulin resistance and hyperglycaemia interact in the pathophysiology of diabetes [8, 9, 10]. A survey of the insulin action/resistance literature in the pre-FOXO era reveals a different landscape from that of today. The biochemistry of insulin action focused on signalling to the glucose transporter GLUT4 , and the pathophysiology of insulin resistance emphasised the impairment of the insulin-dependent transport and utilisation of glucose in muscle , and the role of glucose transporters in that process . Although the excessive hepatic glucose output had been demonstrated to play a role in the pathogenesis of hyperglycaemia  and the effects of insulin and glucagon on gene expression were widely recognised [15, 16], it remained unclear whether the former was due to intrinsic hepatic insulin resistance, and whether the latter had any impact—let alone a major one—on the physiological regulation of insulin action. The advent of genome-editing techniques made it possible to demonstrate that hepatic insulin signalling is essential for metabolic homeostasis, and that regulation of gene expression through FOXO1 has a much larger role in overall insulin signalling than previously assumed [17, 18, 19, 20, 21]. Moreover, the ability of FOXO to link a ubiquitous biochemical signal (Akt phosphorylation) to distinct sets of target genes in different cell types is important for the diversification of insulin signalling in different organs, and has allowed the two cardinal features of diabetes—insulin resistance and beta cell dysfunction—to be subsumed under a unifying FOXO-dependent mechanism. The involvement of FOXO in insulin signalling was discovered in Caenorhabditis elegans [22, 23]. However, the functions of mammalian FOXO are more diverse and complex than initially predicted from the nematode work. There are four FOXO isoforms: 1, 3a, 4 and 6. They have additive effects on gene expression, with FOXO1 accounting for ∼80% of the total effect, and the rest being accounted for mostly by FOXO3 [24, 25]. The overarching physiological role of FOXO is to enable metabolic flexibility, i.e. the ability to switch from glucose to lipid utilisation depending on nutrient availability [24, 26]. However, at a granular level, the modes of action that allow this flexibility are more nuanced (Fig. 1). Thus, FOXO integrate energy intake with energy expenditure in the central nervous system through regulation of neuropeptide processing and signalling [27, 28, 29], in liver through glucose and lipid production [17, 30], in adipocytes through NEFA turnover  and in the vasculature through nitric oxide production and inflammatory responses [32, 33]. In addition, FOXO carry out seemingly distinct functions in tissue differentiation and lineage stability that are especially evident in pancreatic endocrine cells [9, 10, 21, 34]. This notion is illustrated by the role of FOXO in maintaining the stability of insulin-producing beta cells and preventing their dedifferentiation during diabetes progression [10, 35]. However, it should be noted that teleologically these functions are also related to maintenance of metabolic homeostasis through tissue reprogramming. We focus this review on liver and beta cells, not to diminish the established and interesting roles of FOXO in other cell types  (or the latter’s role in diabetes), but rather to clarify the role of FOXO in the hepatic insulin resistance and beta cell failure that highlight the pathophysiology of diabetes. In the mid-1990s, our research group became attracted to the notion that insulin might regulate hepatic glucose production (HGP) through FOXO . We showed that FOXO1 drives the expression of genes important for glucose production, such as G6pc, the gene encoding glucose-6-phosphatase (Fig. 2), the rate-limiting enzyme in hepatic glycogenolysis which has an important role in gluconeogenesis . Physiological insulin levels prompt Akt-mediated FOXO1 phosphorylation, leading to its rapid nuclear exclusion and subsequent degradation . Consistent with the cell biology of FOXO nuclear exclusion, clamp studies in dogs show that insulin repression of HGP parallels a decrease in G6pc expression and an increase in FOXO phosphorylation . Conversely, induced insulin resistance or frank diabetes leads to decreased hepatic FOXO1 phosphorylation and hyperglycaemia . Gain- and loss-of-function experiments have further delineated the role of FOXO in HGP. The former have to be interpreted with caution, owing to technical reasons discussed elsewhere . In aggregate though, the experiments indicate that excessive FOXO activity results in hepatic insulin resistance [30, 41, 42]. Conversely, genetic ablation of hepatic FOXO1 has been consistently associated with marked reductions of glycogenolysis and gluconeogenesis in hyperinsulinaemic–euglycaemic clamps, leading to increased sensitivity to insulin [17, 18, 43, 44]. The functional importance of FOXO1 was underlined by experiments in which diabetes—brought about by ablation of any component of the insulin receptor signalling pathway—could be reversed by simultaneous FOXO1 ablation [17, 18, 43, 44]. Ablation of the three main FOXO isoforms in liver results in highly penetrant (∼30%) neonatal death from hypoglycaemia, highlighting the key role of these proteins in the process of glucose production . Survival is associated with profound reductions in HGP [24, 45]. The most parsimonious conclusion that can be drawn from this compendium of experiments is that insulin can inactivate hepatocyte FOXO1 to acutely repress G6pc expression, without secondary input from other hormones or extra-hepatic tissues. Atherosclerosis remains the number one killer of patients with type 2 diabetes . While the growing emphasis on tight glucose control has enabled us to decrease the impact of the microvascular complications of the disease, macrovascular complications remain an unmet challenge [3, 47] and continue to account for nearly half of all diabetes-related deaths and care-related costs . In addition, recent regulatory requirements all but compel the pharmaceutical industry to be mindful of the cardiovascular complications of diabetes . The liver is a key contributor to these complications (Fig. 3). The diabetic liver can be viewed as overflowing with glucose and atherogenic lipoproteins, such as VLDL-triacylglycerol and small dense LDL. The glucose overflow is chiefly responsible for the hyperglycaemia-dependent microvascular complications of diabetes, while the release of atherogenic lipoproteins are responsible, at least in part, for its macrovascular complications . With the hypothesis that understanding the link between these two processes would provide actionable therapeutic insight, we studied FOXO action in the liver to determine how insulin affects hepatic lipid handling and the lipoprotein profile in diabetes. In normal physiology, as glucose flows in and out of the liver, plasma glucose levels are maintained within a very narrow range in part by insulin-mediated regulation of the ratio of hepatic G6PC to glucokinase. In the absence of hepatic FOXO, neither arm of this control mechanism functions: G6PC is not induced with fasting, nor is glucokinase suppressed by it (Fig. 2). As glucokinase can also promote lipogenesis , the physiological consequences of these changes are that glucose, instead of being released from liver, is shunted toward lipid synthesis, with increases in hepatic lipid content [52, 53] and plasma VLDL-triacylglycerol . In the absence of FOXO, lipogenesis is inappropriately active during fasting, at a time when lipids should be burned down, not built up [24, 55]. The relationship between hepatic glucokinase levels and hepatic triacylglycerol content is supported by studies in patients with non-alcoholic fatty liver disease , and suggests caution with regard to therapeutic approaches based on glucokinase activation . More globally, the fact that suppression of G6PC and activation of glucokinase are so tightly linked suggests a model for the progression of insulin resistance to diabetes in which, as insulin levels rise to suppress G6PC and maintain normal glucose production, they also promote glucokinase, and with it hepatic fat accumulation and triacylglycerol secretion. Thus, an atherogenic lipoprotein profile can be viewed as the price to be paid to suppress HGP during the euglycaemic phase of insulin resistance, as well as the early phases of diabetes. It also means that designing hepatic insulin sensitisers without unfavourable effects on hepatic lipids or lipoprotein profile may prove challenging. Finally, these data would support the idea that prevention of cardiovascular disease in type 2 diabetes has to precede the onset of fasting hyperglycaemia. At a more fundamental level, this observation allows us to propose that FOXO evolved to allow the body to make the choice of whether to use nutrients to make glucose or fat, a rather important step in our evolution. In addition to their role in the G6PC/glucokinase switch, FOXO contribute to hepatic lipid metabolism in at least two other ways. An interesting aspect of FOXO1 biology is its ability to interact with the Notch developmental pathway to co-regulate HGP. The Notch pathway has risen to metabolic pre-eminence through the discovery of its role in beta cell differentiation , circumstantial support for which resulted from the identification of NOTCH2 as a diabetes susceptibility locus in several genome-wide association studies . The observation that Notch is activated in livers of obese and insulin-resistant rodents  and humans  provided evidence that the metabolic actions of Notch are not limited to the beta cell. In multiple models of Notch loss-of-function, such as Notch1 haploinsufficiency or liver-specific ablation of its obligate transcriptional effector, obesity-associated hepatic insulin resistance and glucose intolerance are reduced . Interestingly, as several components of the Notch activation pathway have already been validated as drug targets, the findings raise the possibility of modulating insulin sensitivity through Notch inhibition. γ-Secretase inhibitors (GSIs), small molecule inhibitors that block ligand-dependent activating cleavage of Notch receptors, have been tested in multiple settings, from cancer to Alzheimer’s disease . GSI treatment of obese mice improves hepatic insulin sensitivity and glucose tolerance [60, 63]. Moreover, delivery of a truncated Notch receptor, which acts as decoy to sequester endogenous Notch ligand and prevent receptor activation, increases insulin sensitivity and lowers HGP . Remarkably, treatment with Notch inhibitors prevents the concomitant increase in lipogenesis that plagues hepatic FOXO deficiency. In fact, genetic and pharmacological Notch inhibition decreased HGP and hepatic triacylglycerol, by a parallel reduction in mechanistic target of rapamycin complex 1 (mTORC1)-mediated de novo lipogenesis [52, 64]. Bile acids are cholesterol byproducts with important roles in triacylglycerol and cholesterol synthesis, as well as glucose homeostasis . They act through different receptors, including the nuclear farnesoid X receptor (FXR), the G protein-coupled bile acid receptor TGR5, and non-receptor-mediated mechanisms. Initially synthesised as chenodeoxycholic acid and its derivative lithocholic acid, bile acids undergo hydroxylation at position 12 of the polyphenol ring to yield cholic and deoxycholic acids. Sterol 12α-hydroxylase, also known as cytochrome P450, family 8, subfamily B, polypeptide 1 (CYP8B1) is controlled by FOXO (Fig. 4) . The consequences of this control are very important, because 12α-hydroxylated bile acids are less potent than non-12α-hydroxylated bile acids at inhibiting triacylglycerol and cholesterol synthesis . In insulin resistance, FOXO are more active and increase 12α-hydroxylase levels, favouring the formation of bile acids that promote an atherogenic lipid profile. Data from the Relationship between Insulin Sensitivity and Cardiovascular Disease (RISC) cohort support this idea: levels of 12α-hydroxylated bile acids increased as a function of insulin resistance in euglycaemic individuals and were correlated with plasma triacylglycerol levels . These findings suggest that this constellation of bile acids is a biomarker of atherogenesis. The intrinsic susceptibility of the beta cell to functional exhaustion, what for want of a better term has been referred to as ‘beta cell failure’, sets apart those individuals who go on to develop diabetes from those who, at the same level of insulin resistance, do not . Clinical experience shows that beta cell failure can be reversed, albeit partially, for years on end, even after the onset of hyperglycaemia . There are at least three abnormalities of islet cell function in diabetes: an impaired insulin response to a glucose stimulus (and to a lesser extent to other secretagogues), a reduced number of beta cells and an inappropriate response to glucagon . Our understanding of the regulation of beta cell function has been shaped by the metabolic paradigm according to which insulin secretion responds to metabolic cues. More controversial is the role of insulin itself as a regulator of beta cell function. Although evidence for a role was reported , consensus was not reached, and the debate appeared to fizzle out until it was rekindled by landmark papers showing that genetic ablation of the insulin signalling pathway in beta cells caused signature abnormalities of beta cell function [72, 73]. The concept that insulin provides feedback (or feed-forward) control of its own secretion remains a lightning rod for controversy, but the thrust of our work is that FOXO integrate insulin/hormone-dependent pathways with glucose/nutrient-dependent pathways , thus superseding the debate on whether insulin or glucose is to blame for abnormalities of beta cell function. Our interest in this area was driven by the observation that FOXO are inactive in healthy beta cells, but become activated in response to hyperglycaemia [9, 21]. In advanced diabetes, FOXO1 disappears from beta cells as the insulin content of the cells is lost (Fig. 5). These events are linked: FOXO nuclear translocation is an early sign of beta cell stress, and loss of FOXO brings about loss of insulin, lending a whole new meaning to the term ‘beta cell failure’. There are two main phases to insulin secretion: an ATP-dependent first phase , and a second—or amplifying—phase, variously assumed to be controlled by pyruvate cycling , NADH shuttle , long-chain acyl-CoAs , glutamate  or NADPH [79, 80]. Substrate for mitochondrial oxidative phosphorylation can be derived from glucose, amino acids and lipids. The balance between glucose and lipid oxidation is very important: during fasting, beta cells maintain a trickle of insulin secretion through fatty acid oxidation; after a meal, it is mostly glucose that drives mitochondrial activity. Animal studies have shown that the main role of FOXO nuclear translocation in the early phases of diabetes is to preserve the balance of glucose vs lipids in generating acetyl-CoA for mitochondrial oxidation. They do so by maintaining the activation state of the MODY genes, and suppressing the fatty acid oxidation network supervised by the nuclear receptor peroxisome proliferator activated receptor α (PPARα), to curtail generation of lipid-derived acyl-CoAs (Fig. 6a). This response aims to preserve the physiological load of mitochondria, and stops the beta cells ‘overheating’ [26, 81]. This stress response is, however, not unlimited. There is a penalty to be paid for FOXO activation: it becomes rapidly degraded, leading to its depletion if hyperglycaemia does not resolve . As FOXO levels wane, the balance of lipid- vs glucose-derived mitochondrial fuel is impaired as a result of the loss of the network supervised by genes mutated in MODY and activation of PPARα. As a result, beta cells switch from glucose-driven energy generation for insulin secretion to lipid-driven energy generation. When one examines the ability of FOXO-deficient beta cells to oxidise glucose and lipids—two of the main sources of energy for mitochondrial ATP production—an interesting observation emerges. Glucose oxidation is dose-dependently impaired compared with normal beta cells, whereas lipid oxidation is abnormally increased. Moreover, whereas lipid oxidation is suppressed by a rise in glucose levels in normal beta cells, it fails to be suppressed in FOXO-deficient beta cells. These data indicate that the ability of the beta cell to switch from lipids to glucose as an energy source for ATP generation, for example in the fasting-to-feeding transition, is greatly impaired. Excessive lipid oxidation leads to generation of toxic products, primarily peroxides, and impaired ATP production, calcium mobilisation and insulin secretion (Fig. 6b) . This inability to adapt from lipid to glucose utilisation is similar to what has been described in other tissues as metabolic inflexibility . We would like to propose that this inflexibility is a key step in beta cell failure. What are the long-term consequences of metabolic inflexibility? Beta cells gradually lose, along with insulin secretion, their terminally differentiated features. This conclusion was arrived at using lineage-tracing studies to monitor the fate of beta cells during diabetes development. The expectation of these experiments was that, if diabetic beta cells died of apoptosis, they would simply disappear over time. Instead, beta cells were still present but had lost their defining features and had partly turned into glucagon-producing cells, providing a potential explanation for the hyperglucagonaemia of diabetes . This observation has now been reproduced [83, 84] and significantly advanced by the demonstration that dedifferentiation is indeed reversible [35, 85], raising the possibility of new treatments for beta cell dysfunction. The discovery of FOXO has not only advanced our understanding of insulin action and the pathophysiology of insulin resistance, but has also highlighted questions that remain unanswered. Residual regulation of HGP in the absence of FOXO indicates that there are (1) FOXO-independent pathways of insulin and glucagon signalling, and (2) indirect mechanisms acting on the liver. As regards to the former, analyses of gene regulatory pathways in the absence of FOXO show swaths of genes that are unaffected by FOXO ablation. A glaring example is Pepck, which encodes phosphoenolpyruvate carboxykinase [17, 24], an enzyme that regulates flux through the mitochondrial citric acid cycle . It, and similar genes, could be under primary control by glucagon . The glucagon pathway has been mapped in work by Montminy and associates, and centres on the cyclic AMP response element-binding protein (CREB)-regulated transcription coactivator (CRTC) family of transcriptional regulators [88, 89, 90]. There are striking symmetries between FOXO and CRTC. Both appear to follow the script of hormone-dependent activation by nuclear translocation, albeit in different directions. Thus, in response to cAMP generation, CRTC1 and -3 are dephosphorylated and undergo nuclear transfer to bind to CREB transcription factors and drive gene expression [88, 89, 90]. An unanswered question is whether the FOXO and CRTC pathways do in fact interact. In this regard, it is important to note that glucagon has also been shown to activate FOXO through calmodulin-dependent kinase II . In fact, constitutive activation of this kinase in hepatocytes is sufficient to abrogate insulin-mediated FOXO1 nuclear exclusion , suggesting the expected antagonistic relationship between these hormonal regulators of HGP. With regard to the issue of direct vs indirect effects of insulin on HGP, it bears repeating the obvious: there are direct hormonal effects on enzymatic flux that do not require signalling through canonical pathways or regulation of gene expression . In fact, what is surprising about the work on FOXO is not that there is residual regulation of HGP, for one would have hardly predicted otherwise; the striking thing is that there is any effect on this process by altering gene transcription, highlighting the greater than predicted contribution of gene transcription to hepatic hormone action. The indirect effects of insulin on HGP would have been expected to trump the direct effects, based on the following evidence. First, insulin receptor signalling in hepatocytes is necessary, but not sufficient, to confer on insulin the ability to suppress HGP [92, 93]. Second, the central nervous system plays an important role in rodents to modulate insulin sensitivity of HGP [29, 94, 95]. Whether the same is true in humans is not known . Third, an inability of insulin to suppress NEFA during hyperinsulinaemic glucose clamps is associated with failure to suppress HGP, despite normal insulin signalling in hepatocytes . Fourth, signals emanating from various liver cell types, including sinusoidal endothelial cells, also play an important role in regulating HGP in hepatocytes through a paracrine mechanism . All these data point to a dominant role of substrate flux over signalling in the regulation of HGP. With regard to the beta cell, the discovery of dedifferentiation as a potential mechanism of failure poses a conceptual challenge to this therapeutic area. A survey of drug development in the treatment of beta cell dysfunction indicates that most efforts continue to be directed towards developing new, ‘smarter’ secretagogues. This approach is fundamentally challenged by the notion that, as beta cells strain to keep up with demand, their insulin content declines and they become dedifferentiated. On the other hand, we do not want to encourage therapeutic nihilism, i.e. the idea that it is best not to intervene at all against beta cell dysfunction. Although decreasing the ‘afterload’ of peripheral insulin resistance will provide relief to the faltering beta cell, the precariousness of beta cell function in the prediabetic state suggests that some level of intervention to protect beta cells will be necessary to preserve their long-term function. Given the dearth of predictive models of long-term beta cell function and the difficulties of assessing durability, the challenge is formidable. But so are the tools that can now be enlisted to address this challenge, ranging from whole genome sequencing to mass spectrometry, imaging and stem cells. 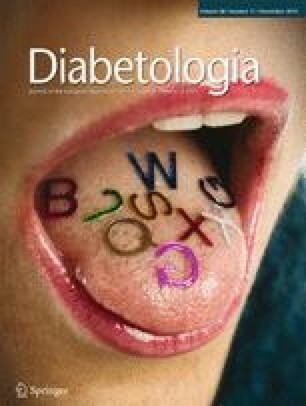 In sum, our work and that of our colleagues has shown that important lessons about the pathophysiology of diabetes can be learned by applying knowledge derived from basic science. It stands to reason that the systematic gathering of data on the mechanism of insulin action is bound to yield better mechanism-based cures for our patients. D. Accili wishes to acknowledge the outstanding originators of this work: Paola Salvatore, Giovanni DiCola, Carla Hanash, Hiroko Kanno, Yoshiaki Kido, Neubert Philippe, Byung-Chul Park, Kristina Rother, Davide Lauro, Jun Nakae, Jane Kim, Tadahiro Kitamura, Yukari Ido-Kitamura, Shehriar Heydari, Marta Hribal, Haruka Okamoto, Francesco Oriente, Fredly Bataille, Donatella Gniuli, David Frescas, Aninidita Nandi, Luca Valenti, Michihiro Matsumoto, Jean Buteau, Marianne Spatz, Hua Lin, Alexander Banks, Leona Plum, Jun Tanaka, Rebecca Haeusler, Shivatra Talchai, Yitian Liu, Kumiko Aizawa, Angela Svendsen, Taylor Lu, Kyoichiro Tsuchiya, Ryotaro Bouchi, Francesca Cinti, Li Qiang, JaYoung Kim-Muller, Hongxia Ren, Garrett Heinrich, Emi Ishida, Joshua Cook, Anna Ordelheide, Fanny Langlet, Diana Kuo, Jason Fan, Jinsook Son, Tommy Kolar, Ana Flete. This work has been supported by the US National Institutes of Health (DK57539, DK58282, DK64819, HL87123), American Diabetes Association, JDRF, Berrie Foundation, Brehm Coalition, JPB Foundation.